That's it! Time to show off what you've learned in the class! Please post your graduation videos here. Also, let me know which one of the training videos you would like to get as your graduation gift and I'll send you a download link. I have a question. How long this present puppy trick class will be open for us? I signed up as auditor and some things we got down pat and some still work in progress. Will this class be still accessible for us on line? Sure, it will be available for at least 2 more months, possibly more. Yay, Penny!! I’m so glad to hear she’s feeling better. I meant Rocket and Heidi! Oops! Glad to hear that Penny is feeling better! And yes, sure, you can post your graduation video later, no problem! Here is our short Graduation Video. I have only main tricks, as time and injury has prevented us doing more. I have particuarly worked out in our yard for this video as we have had a scare for Tegan this week with neighbours boys using their Slug Guns and she is very noise sensitive so has not been keen to go outside at all. I am very happy with what we managed to get outside today. I have loved doing the class and plan to complete all the tricks when we have more time and confidence. Hope to see you all in Foundation. Gratulation to your final video! Love the way you throw the ball in front of the camera!. And sure a good start for Agility! Yeah. The accent gets serious points. Tegan too! What accent? ha ha, yes it’s a mix of aussie and kiwi. Great job!!! She sure is quick! Her sit up and sit up to down and back are just too cute! For cik&cap, you can as well use just a pole alone, it’s actually better as a wider object as you can see better how well she wraps and uses her body. But you two sure look ready for Foundation class! 🙂 Let me know which video you want for a graduation gift! Thankyou, I have changed the pole for Zigzag and she is starting to get it better. Could I have the Cik&Cap video please. What a really nice moving 2o2o! You’ve given me the image of what I want with Echo as we go into Foundations. And I really liked your Cik Cap as well. I have been trying to release the 2020 as soon as she is in position as when we first started out last year (before injury) I was making it all about the stop and wait. It got to the stage where she was not leaving the perch because it was too well rewarded to stay, and I had made it all about the stop, not the release. She was thinking too much. Hope that makes sense. I can’t wait to see how we progress with Silvia. Our Cik&Cap is going to be called “Zig” and “Zag” for us as it’s easier for me to say. She looks great in the video, but we need to work on it more as she tends to go around one way, and then if I ask to go again, she flips around and goes back the other way!!! Again thinking too much !! Thanks for the advice. I think I’ve been focusing too much on the wait. But right now she does a much better back into 2o2o than forward run into it. I have to work on that. This was such a great class. Thank you Silvia and classmates for all that you brought me and my dogs. Here is our graduation video. And we’ll see you soon in Agility Foundations! What a video! It was such a pleasure to watch it ! Your not only a good trainier but also a good film producer! Thanks for showing! Thanks Sandra! I had a great time making that video. My husband was very patient on our vacation when I spent a LOT of time filming and creating. I’m so proud of my little girl! Your final video was so professional and beautiful to watch! Thanks for the inspiration! Really nice! We enjoyed that! FANTASTIC video Rachel!!! So proud of and happy for you guys!! Thank you Melanie -- both for the compliment and for “introducing” us to Silvia -- what a fun ride so far!! Sorry, messages all over the place. Thanks Stacey with an “e”, where’s your grad vid? Your Tervuren is very clever! Your video skills are awsome! I have a good freind with a Tervuren who just gained her Novice Agility Title last weekend, her and her husband have litter mates, Heidi and Yoda. I will have to tell her how smart Echo is. What? that was meant to be after Rachel & Echo’s video. My Tervuren is a rock star, it’s true. But I thought she was before she learned a single trick so I’m just biased!! Ah, don’t worry, agility is easy: it’s either a turn or a straight line 🙂 -- and obstacle performance is just another trick. Oh, Silvia. We need more people in the world like you. Just sayin’!! Wow, what a cool video! And what great mastered tricks, it’s really amazing how many tricks you two mastered! Great precision with bowl into bowl trick! Loved the zoom trick and the bloopers the most though, too funny! 🙂 Let me know which video you want for graduation! I have all of your videos (and they’re all great). Perhaps I could have a second download of the heeling video for my husband to have on his own computer? Oh! I missed that you had a NEW video I don’t have yet -- Thinking Tricks for me, please. Congratulations Rachel ! What a great video !! Waauw, really nice and what a lovely idea to add bloopers, they made us laught a lot ! Thank you Emily. The bloopers do seem to be the favorite!! Here is Grit’s graduation video. I’ll admit I didn’t really want to make it, and was feeling kind of lazy, but wow, I’m glad I did! It was fun to see how much little Grit learned in a VERY short amount of time. We are ready for Foundation!!! Love the cross paws, begging is so cute with that face! Skateboarding too ! That was too cute! Loved the tricks, camera and music! Grit sure is a quick learner! Had to see that bowl stacking three times, that was just too cute! Let me know which video to send! Thank you so much! This class has been helpful on MANY levels. It encouraged me to slow down and enjoy my puppy. It taught me how to appreciate the little tiny details and celebrate itty bitty successes. It showed me just how FREAKIN SMART my puppy is. And my goodness, she now has dozens of skills all designed to help her play the game I love so much. Really, what more could a person ask for??? Cutie pie!! What a nice video! Fantastic! I LOVE the limping -- look how great she’s doing. And the sit up to stand was lovely -- great “hands up high in the air” and what nice duration! Lady-like cross paws, all power girl slamming the doors and drawers. Can’t wait to see this girlie running agility. Here is our Graduation video. My little girl really has grown up since the beginning! We had much fun, learning all the Tricks. Thank you Silvia for this great programm! We learned so many Tricks that I wasn’t abel to shorten the video! Sorry, that it is again so long! @Rachel: I had the same idea with the bloopers, but didn’t know how tho name theme. Hope ist’s O.K for you that we also show our funny ‘bloopers’! 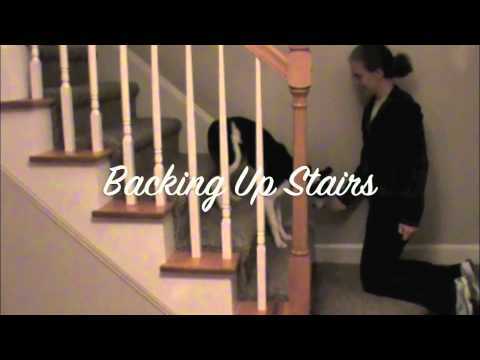 Great video, great dog, great tricks! Ayoka sure mastered MANY tricks for such a puppy! It was so much fun to see her grow and this video really shows it all, I’m sure it will be a great souvenir! Let me know which video you want to get for graduation gift! What a nice gesture of you, giving us one of your videos! I think Cik& Cap-turns would be nice for us to continue with the agility foundation! 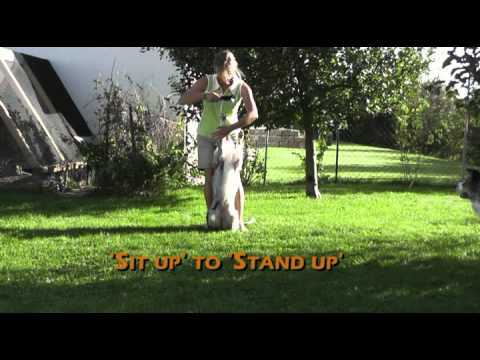 yes, sometimes it costs more energy to keep the other dogs down than teaching Ayoka a new trick! Really great -- this dog grows before your eyes! waauw, really fantastic video ! We enjoyed it very much ! You master so many things together ! Congrats ! Thank to all of you. When making the video I couldn’t hardley believe, that we learnded so many things in this short time, too! Well, at least foundations went better! And now the snow is already here and we have no shortage of indoor tricks to work on. We’ll post a proper graduation video when we complete this list! Always fun to see little Sen, she is just too cute! Loved the slamming! Let me know which video you want to get! You´ll see her do the list -- I promise! We would love tricks for better thinking skills 🙂 -- then we´ll add those to the final collection. She’s such a sweet and enthusiastic girl. I love watching her do tricks with her e-collar on! How brave. GREAT spins!